HP has tried to solve the age-old issue of power versus portability by creating the 12.1-inch Pavilion dv2-1010ea, which aims to combine portability and multimedia functionality. Weighing only 1.8kg, you won't have any problem carrying it around with you. 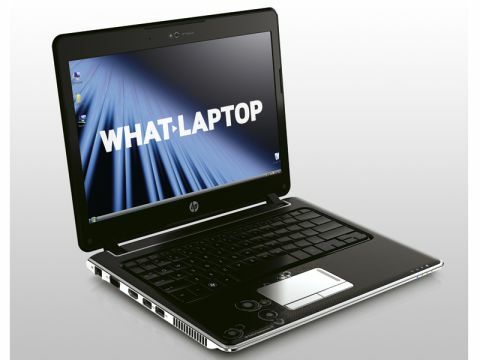 The chassis, built of glossy plastic and magnesium, combines great looks and durability, although some might be put off by HP's Imprint-patterned finish. The keyboard is solid and, at 92 per cent full-size, a pleasure to use. The keys are spread out and feature cut edges, which makes you less likely to strike the wrong keys when speed-typing. The touchpad is large and smooth, and the mouse buttons are well-defined and responsive. The 12.1-inch, 1280 x 800-pixel screen is very bright, thanks to its LED technology. Photos and DVDs look fantastic, but the screen suffers reflections due to the shiny Super-TFT coating. The thick frame surrounding the screen provides good protection, but makes the panel appear smaller than it actually is. To try and achieve a successful combination of portability and performance, HP has worked closely with processor manufacturer AMD to create the Athlon Neo chip – a processor designed to deliver high-performance in a compact chassis. However, while we found that using the laptop for word processing and web browsing wasn't a problem, resource-heavy activities such as film editing and gaming proved too much for the CPU. Benchmarking tests further confirmed this, with the dv2 proving only slightly more powerful than the average netbook. Nevertheless, the HP is well-provisioned elsewhere. Despite not featuring a built-in optical drive, every laptop ships with a slim external DVD drive, making it possible to watch films when at home. The drive also boasts LightScribe technology, for burning images or text on to the surface of compatible discs for easy labelling. Connectivity is fairly average, with 802.11g Wi-Fi included, but a good connection speed in hotspots shouldn't be an issue. Three USB ports also let you connect external peripherals, and the HDMI-out port makes it easy to connect to an external high-definition (HD) screen. Ultimately, the Pavilion dv2-1010ea falls slightly short of HP's promises. While you will be able to carry out office-based activities at home or on the move, as well as watch DVDs and perform light photo-editing tasks, it simply isn't powerful enough for more intensive multimedia use. In the end, similar performance and greater portability can be found elsewhere for less money.